Here you’ll find up-to-date information regarding the health of the Vail Valley economy. Detailed annual reports are available at the bottom of this page, along with links to a number of special reports. Information includes sales tax data, local employment information, real estate performance and more. Scroll below to review the three-year quarterly performance of several key economic indicators. Sales tax collections peak in the first quarter and are at their lowest point in the second quarter. First and second quarter 2018 sales tax is up from the previous two years. Fourth quarter 2017 is higher than 2016, but lower than 2015. The size of the labor force is substantially higher during the first quarter than in any other quarter. The unemployment rate varies by quarter and although it has declined considerably over time, quarter 2 2018 is higher than quarter 2 2017. 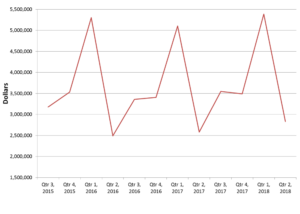 The spikes in the labor force in the first quarter of each year reflect a sizable seasonal population that is employed during the height of the tourist season, but do not remain within the county year-round. Overall, the unemployment rate has remained quite low since quarter 3 of 2016. 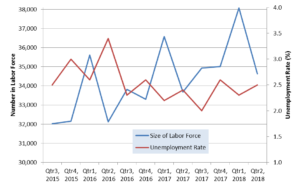 The size of the labor force has been consistently growing over this time period, with each quarter showing growth when compared to the same quarter in the previous year. Economic Stress is at its minimum at values right around zero to slightly positive. 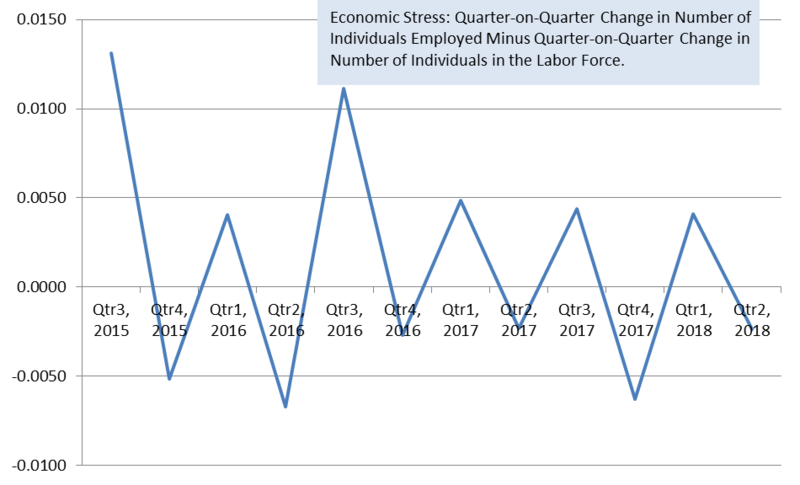 High positive values indicate situations where the number employed is growing faster than the size of the labor force, producing labor pool shortages over time. 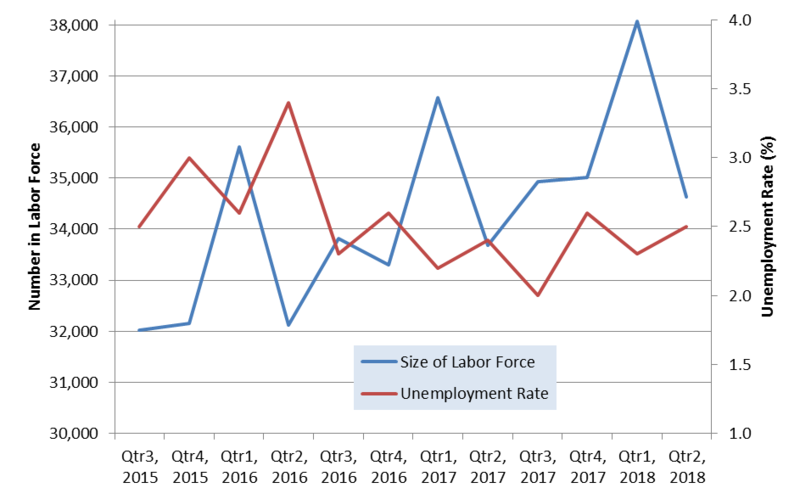 High negative values indicate situations where the size of the labor force is growing faster than the number becoming employed, increasing unemployment rate over time. 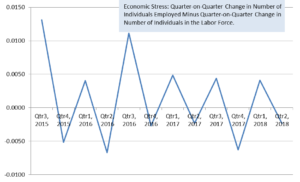 With the exception of quarter 4 2017, economic stress has been relatively low since the last quarter of 2016, indicating a good balance between the size of the labor force and the number of individuals who are employed. 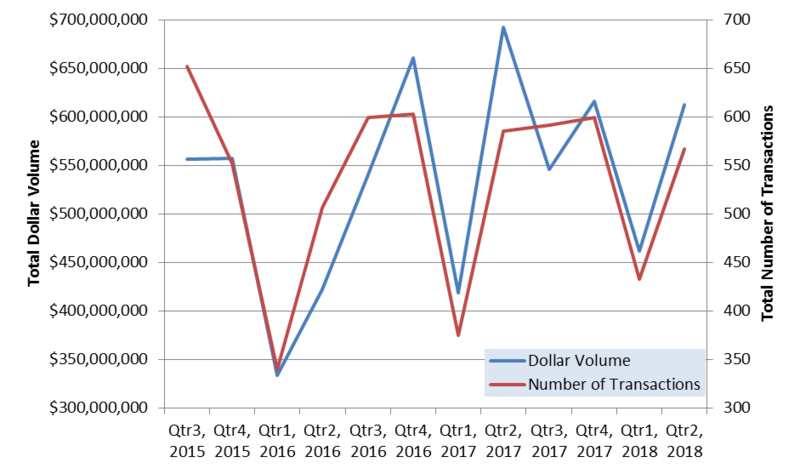 Dollar volume and number of transactions are at their lowest point in the first quarter of each year. 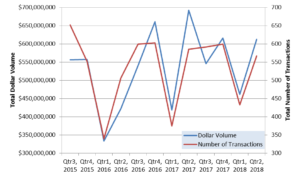 Quarters that show that the number of transactions is well above total dollar volume indicates situations where there are a disproportionately high number of transactions that had a relatively low sale price. The first quarter of 2018 saw higher dollar volume and number of transactions than the prior two years. 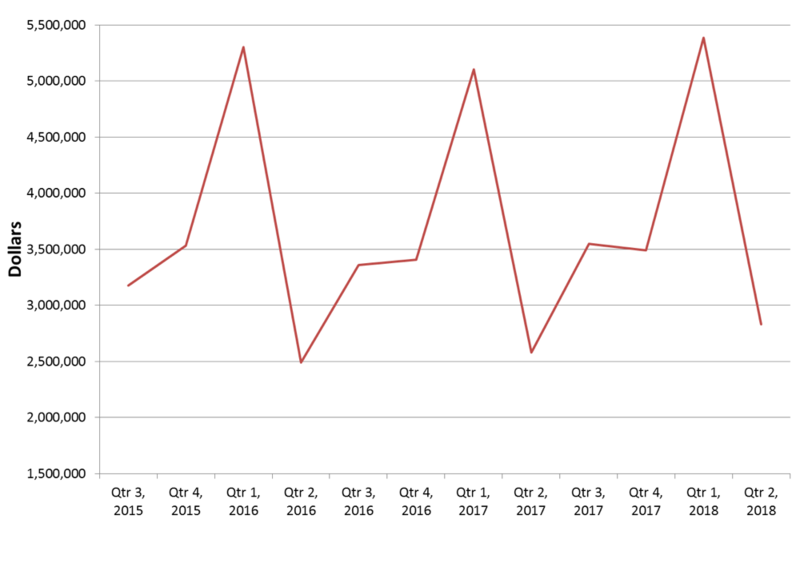 Quarter 2 2018 performance was better than the same quarter in 2016, but the number of transactions was slightly lower than quarter 2 2017 and dollar volume was considerably lower.